TAMPA, FL and SAN DIEGO, CA--(Marketwired - Dec 16, 2015) - KiteDesk, the maker of smart sales prospecting software for sharp salespeople, today announced the availability of two new products specifically for high-growth sales teams: KiteDesk FIND and KiteDesk REACH. The KiteDesk FIND product is a reimagination of the company's previous core offering. It features a new-to-the-industry visual interface around FINDing targeted leads, plus extensive account-based prospecting and prospect assignment. KiteDesk FIND also now validates emails for the prospects it finds, ensuring high deliverability rates. "The human brain processes visual images 60,000 times faster than text," said Sean Burke, CEO of KiteDesk. "We're now creating a way to discover new leads using our visual search capabilities that are both intuitive and timesaving while, at the same time, becoming more accurate." KiteDesk customers will discover a new visual layer around company geography, size, revenue, hierarchy, titles and keywords available to build targeted lead lists in record time. 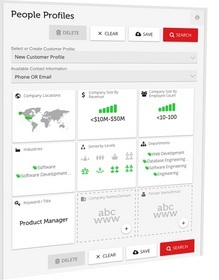 KiteDesk FIND also provides the ability to save unlimited profile searches. "Sales teams often waste hours prospecting, digging up the wrong prospects," said Eric Quanstrom, KiteDesk Chief Marketing Officer. "We think there's a better, more targeted approach through blending much of the marketing intelligence around Ideal Customer Profiles, or ICPs for short. It's exciting because KiteDesk customers can now build, save and work targeted lead lists that closely match their target customers from beginning to end. It's airtight -- and you won't see it anywhere else." Once you've found the right prospects, the ability to communicate immediately across multiple channels is imperative. 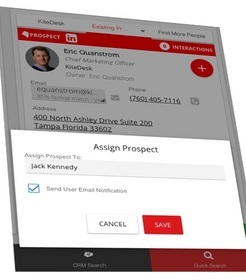 KiteDesk REACH pairs with FIND to deliver this capability at the top of the funnel. 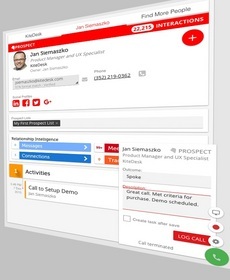 KiteDesk REACH provides 1-click dialing with an integrated softphone, complete with call recording, bridging and save to CRM features. KiteDesk REACH also adds email tracking, signature, and templates for the sales team. "We knew that sales departments are changing, and most sales development reps, account executives and their managers require sales intelligence at the prospecting level," said Quanstrom. "Our integrated approach makes everything these reps are doing not only more effective and focused, but also directed and faster. It's a revolution in the sales stack and we're leading the way forward here." Define rich email templates that can be saved and reused when sending messages. Create an email signature with graphics and links. Used automatically across emails and templates. Automatically track email opens and link clicks. View start-to-finish activity and email tracking for prospects. "KiteDesk bridges the gap between a company's Marketing Automation platform and their CRM," said Burke. "It's an entirely new space for sales organizations, one that integrates marketing thinking around the Ideal Customer you're targeting. We're arming sales reps with smart tools to crush top-of-the-funnel growth in semi-automated ways." KiteDesk's products (KiteDesk FIND and KiteDesk REACH) provide smart sales prospecting software for growth organizations. As the first lead generation system to combine an on-demand Prospecting Toolbar, Chrome Extension, Web App and clickable Kite icons, we help salespeople dramatically decrease the amount of time spent generating qualified leads. KiteDesk is a venture-backed, privately-held company headquartered in Tampa, with offices throughout the United States. To learn more, please visit www.KiteDesk.com or connect with us on LinkedIn, Facebook or @KiteDesk.